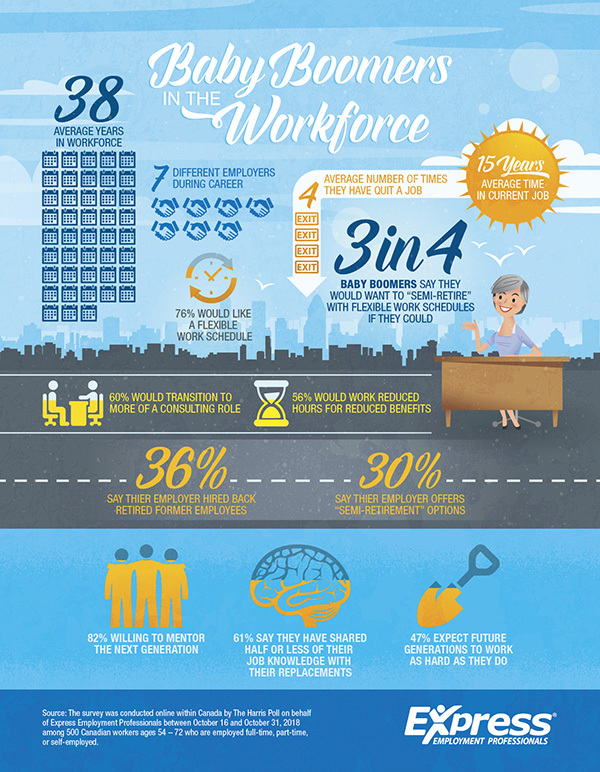 Toronto, Jan. 23, 2019 - With the number of Canadians of core working-age at its lowest proportion on record and projected to keep falling, a new survey conducted by The Harris Poll and commissioned by Express Employment Professionals, found that employed baby boomers want to keep working in retirement, but most say their company doesn't offer the option. "If something doesn't change, there's going to be a big knowledge vacuum when boomers leave the workplace," Stoller continued. "Many employers lack the formal structures to pass on valuable information between successive generations. But there's a big opportunity staring us right in the face: boomers are eager to help pass on their knowledge, and allowing them to do so in a ‘semi-retirement' capacity could solve two problems at once: the need for knowledge transfer and boomers' desire for workplace flexibility." The survey was conducted online within Canada by The Harris Poll on behalf of Express Employment Professionals between Oct. 16 and Oct. 31, 2018, among 500 Canadian workers ages 54 – 72 who are employed full-time, part-time, or self-employed. Results were weighted as needed for age by gender, education, race/ethnicity, region and household income. Propensity score weighting was also used to adjust for respondents' propensity to be online. Totals may not equal the sum of their individual components due to rounding. No estimates of theoretical sampling error can be calculated; a full methodology is available upon request.